Designed for wellness professionals, medical practitioners and personal trainers, the DexaFit Pro Certification is an evidence based, educational pathway designed to teach industry professionals how to increase performance through a deep understanding of how the body functions. Show your clients you are on the cutting edge of health, fitness, and nutrition. Attract new clients and retain more using science-based insights. Learn how to leverage the same information used by leading sports scientists. The DexaFit Pro Certification is your springboard to a deep understanding of body composition, cardiovascular fitness, and metabolic health. Become an authority and turn what you know into science-based results. If you’d like to learn more, join the free presale list below. The program opens this fall. But, if you’re on this list, you’ll save up to 33% and get the chance to enroll 24 hours early. To help you master the art of using science-based body, fitness, and metabolic health results, so you can get life-changing results for yourself and the people who come to you for advice. Learn how to use advanced medical-grade testing to understand the body’s limitations. Discover how to address those limitations through the proper channels, including nutrition, physical rehabilitation or strength and conditioning exercise. This is the system the pros turn to. Learn from our 20+ years working with NFL, NBA, UFC, and NHL athletes, to recreational exercisers, to Fortune 100 companies. DexaFit technology and methodologies are considered the gold standard by science. Active promotion to DexaFit users. 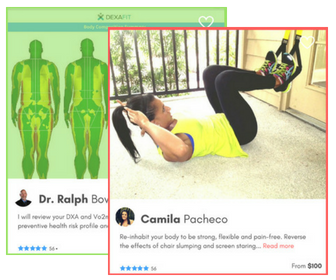 Appear on DexaFit's marketplace platform where DexaFit users from across the country search for professional support to help them achieve their goals. Submit written articles for review and publication on the DexaFit's website, an incredible way to establish yourself as a leader in the industry and increase traffic to your own web platform. Receive the DexaFit logo and DexaFit Certified Pro Logo for use in online and printed marketing efforts. … you can become DexaFit Certified. In addition to learning how to leverage medical-grade insights about your clients or patientes, you’ll understand how people think and act, and you’ll be able to turn that into a thriving coaching practice. Amy brings 25 years of healthcare and executive management experience to DexaFit. Previously, she was clinical director of the Bone Density and Body Composition Center at Sequoia Hospital near San Francisco. Over her career, Amy has worked with nearly 80,000 clients, including many well-known fitness experts as clients such as author Tim Ferris. She regularly speaks to physicians and other groups on bone density and body composition. She has also been a facilitator and lecturer for the National Osteoporosis Foundation Support Group in San Francisco since 1998. Dr. Ben is DexaFit's Science Adviser in charge of all metabolic and cardiovascular fitness testing protocols and training. He works as Sports Science Director for the Philadelphia Flyers, and his experience includes working with performance coaches of elite teams worldwide and helping them identify and evaluate contextual analytics by measuring training loads – biomechanical and physiological load quantification’s – to improve performance outcomes and reduce soft tissue injuries of athletes. Dr. Chad Cook brings over 15+ years of experience using DexaFit technology. His background includes Exercise Physiology, Human Nutrition & Exercise Physiology, and he's a PhD in Nutrition Science. For the past 15 years he's overseen the design and conduct of human dietary intervention studies, including the statistical analysis and publication of resulting data. Board-certified in Internal Medicine, Pediatrics and Sports Medicine, Dr. Sandra Bender brings over two decades of health, wellness, and medical experience to DexaFit. She is the former team physician for Northwestern University's Athletic Department, where she first started using advanced medical-grade technology to help her athletes and patients optimize their health, fitness, and performance. Include our services with yours. Get preferred pricing. Let us help you market your new solutions with our help. Submit a short questionnaire describing yourself, your experience and services. Receive your course materials. Work through the online course and videos at your own speed, anywhere in the world. Take the exam online and achieve 75% to pass. Appear in front of 500,000+ users on the DexaFit platform and marketplace. Get matched when a DexaFit users requests support from a Pro. Read important FAQs before becoming a certified Pro. Q: Are there any prerequisites to becoming certified? A: No, however it helps if you've already visited DexaFit before, or if you have previous experience in exercise science or physiology. Q: What is the cost to be certified? A: The general public price of the DexaFit Pro Certification is $99 USD per month for 12 months, or $999 prepaid. Your course tuition includes all course materials, promotion on DexaFit's marketplace platform, matching with DexaFit users searching for pros, and additional benefits outlined below. Q: What happens after I'm certified? A: After completing the Pro course, you will be showcased on the DexaFit website, email list, and marketplace to all DexaFit users searching for professional support. We will match you with users that request a speciality related to yours. Q: What else do I get with my certification? Separate yourself from the competition and show your clients you're on the cutting edge of the personal health revolution.